On 16 May, I was awakened at 4 am by loud gunfire. I had expected it, of course – it was SPLA day after all, South Sudan’s day for celebrating the army – but it didn’t make it any less stressful. Whether you call it celebratory gunfire or ‘happy gunfire’, as we used to say in Afghanistan, the sound of a gunshot is inherently violent to me. Between the rapid-fire pop pop pop and the slower and deeper sounds of the CHUG CHUG CHUG, I crawled over to the side of my tent to get a better look. Gripping the sides of the tent flaps, I peered out to see streams of red fire shoot like broken lasers through the air. (A friend later described these to me as tracers, bullets that allow shooters to see the trajectory of the projectile so that they can take corrective action). I figured there were at least two or three shooters right on the other side of the bamboo fence and quite a few more nearby. While I’ve heard gunfire before, it was a strange feeling to be so close to so much of it without any form of security around. I couldn’t help but think, what if something goes wrong? Of course, I desperately had to go to the bathroom (damn tiny bladder). I knew that I wasn’t any safer inside the tent than outside, but for some reason I just couldn’t bring myself to walk 30 feet to the latrines while there was active gunfire going on. So I peed in a mug. Yup, that happened. I didn’t sleep a wink until the sun rose (when I ran out of the tent super stealthily to throw the mug into the garbage pit). Most of my colleagues brushed off the gunfire as ‘business as usual’ and for the most part it was… but I must admit, I was shaken. It made me realize just how quickly things could change here and how we really are just sitting ducks. 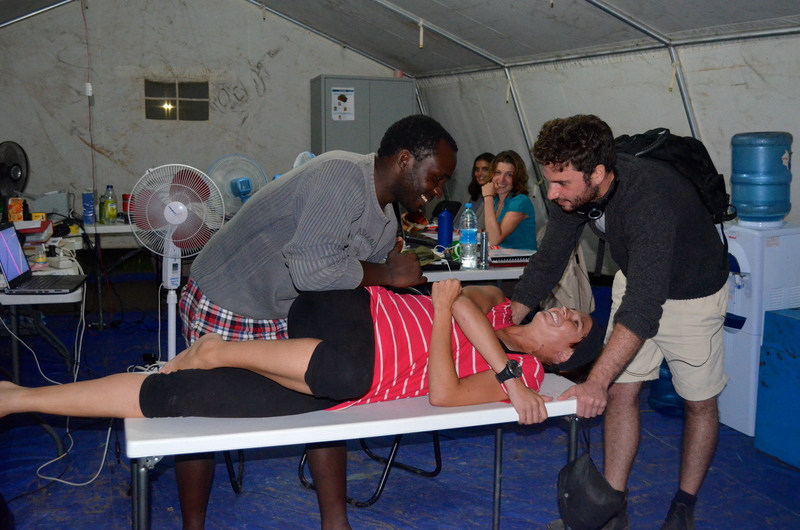 Tent-based physiotherapy: working on my SI joint problems… Thanks, Handicap International! the heat… but I’ve also just had more important things on my mind, which hasn’t been a bad thing at all. I’ve given myself permission to take a break and it has been a bit of a relief. Normally running helps me manage stress, but my body has just reached a level of exhaustion and I know running won’t do me any good right now. Instead, I’ve shifted my focus to my work this week, which has been incredibly powerful. The chance to be here and stand in solidarity with others is truly a privilege. At least this is what I remind myself in those hair-pulling, tear-blinking moments when I’m at risk of being overwhelmed by the challenges piling up before me! (I had one of them at the police station yesterday morning following up on a case.) Don’t get me wrong, my role here is small. I’m not kidding myself about what kind of change I can actually effect when the problems are so large. And I’m sure if I wasn’t here, there would be someone else in my place doing the same thing… but it is pretty special when you see that you have actually had a tangible impact on one person or one family in one moment. So I concentrate on those small wins. I have no doubt that I’m getting more out of this experience than I’m giving back, but I’m at least trying to recognize it. Yesterday when I was ‘footing’ back to my compound (the South Sudanese word for walking), a group of older women walking by stopped to greet me, smiling from ear to ear and chattering non-stop. I could only pick up a few words, but it wasn’t hard to tell that they were happy about something. Pretty soon, they had surrounded me in a circle, singing and dancing in celebration. Their brightly-coloured robes twirled around me as they jumped up and down in unison, clutching their breasts and shrieking out in high-pitched voices. I joined them in the dance, clutching my laptop bag instead of my chest, which prompted one of the others to grab it for me instead. It should have been a really strange moment – jumping around erratically while practically being fondled by a woman who didn’t speak my language – but for some reason it just made sense. I added in a few shrieks of my own, which sent the crowd into hysterical laughter, and hugged a few of the women before carrying on my way. As I wiped the sweat from my upper lip and rearranged my bag across my chest, I realized that I couldn’t stop smiling. We may be dancing in circles here, but perhaps we can do it together. Cholera has started to show up in the site and the number of cases in Juba has quickly risen to about 400. Not good. I’m heading out to Juba on Wednesday to meet up with a dear friend from Afghanistan and then to Zanzibar on Friday to get into a whole bunch of mischief. Nine days on the beach with a cocktail in each hand is just what the doctor ordered… I intend to be completely irresponsible until the moment when I hop back on the plane to Juba. Watch out, Z-bar! A huge thanks to those of you who have already offered to help out with Free to Run. I’m really touched by the support! Reply emails are coming very shortly. Um… wow! I was doing a search for “running blogs” and I ended up here. I’m really moved by your words—“So I concentrate on those small wins.” I’m a social worker back in the States, and much of my work (I work with homeless people and people with severe mental health disorders)—let’s just say, a lot of my effort does not add up to small wins. So when I’m actually able to help someone, I have to hold that victory close and remember it! It sounds like you’re doing some incredible work—keep fighting the good fight! Certainly not back home (re: random gunfire just because), but you’re doing excellent work … keep it up! A lot of people don’t think of their small feats. But in reality, everyone should use those feats as motivation to complete their next goal! You need to take small steps to make it to the top, and this is a great article relating to that statement! Keep up these great motivational posts, and you’ll slowly continue by helping the rest of the world! Ha, I hope you never have to! !